NO TO COUNCIL's SHAM CUTS CONSULTATION - YES TO A PEOPLE'S BUDGET! "Poor turnout at My City, My Say forum in Meir" was the Sentinel's verdict on last night's council 'consultation' public event in Meir. As you can see from the Sentinel article (linked above) not one person came along to the 'consultation' forum in Meir to ask FOR cuts to carried out. Despite this the council will continue to use these forums as an opportunity to try and smooth the path for more savage cuts than we have already suffered. In reality, Stoke-on-Trent city council's now annual sham consultation with residents will be met with indifference and anger across the city. What is there to discuss with a Labour council that has already slashed thousands of council jobs, forced through the closure of care homes, children centres, libraries, swimming pools etc despite massive opposition, and already announced it will make staggering cuts of another £150 billion to council jobs and services over the next six years? If they have already decided to carry out these massive amount of cuts then the 'consultation' is a waste of time and money. There is only two questions really worth asking the city council. Firstly, "can you tell us what services would actually be left after another six years of cuts?" If they are honest, which is unlikely, they would have to admit that further cuts of £150 billion would mean the vast majority of services will be either cut, closed or privatised. The second question flows automatically from their determination to carry out the Tories' cuts, "What is the point of a Labour council or any other council that continues these slash and burn policies?" 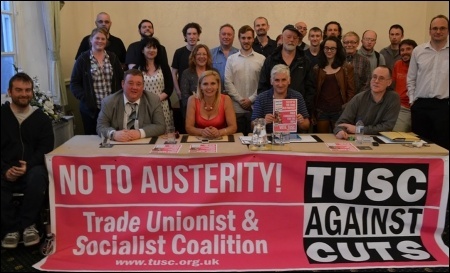 Plymouth councillor Alison Casey will be speaking on Wednesday 3rd September at the first of a series of TUSC-hosted meetings across the city to draw up 'A Peoples Charter for Plymouth' as an alternative to the establishment parties' austerity policies. Alison, a councillor for Moor View ward, will be explaining why she left the Labour Party and how she will now be better able to serve the community as an independent. Also speaking at the 'Have your Say' public meeting, starting at 7pm at the Estover Youth Centre, Torbridge High School, will be Senior Youth Worker Nathan Cole, who will be talking about Estover Youth Club and the work of the Youth Service. Local community groups like Friends of Miller Way have also been invited to speak about their campaigns and activities. Plymouth TUSC co-ordinator Alex Moore stresses that this is "not just another consultation exercise. We put people before profit and our council budget would not be based on what the Tory government tell us we can spend but on what the people of Plymouth need. The people in Moor View can be confident that we will adopt their demands for their community into our Charter and we will ask them to help us fight for it in the elections next May! "From calls for green spaces to skateboard parks, TUSC promises that there will be plenty of time for people to have their say. Everyone is welcome!" The launch of the 'Peoples Charter' consultation meetings, and the participation of Plymouth's rebel councillor in this anti-cuts initiative, has already made the pages of the local paper (see http://www.plymouthherald.co.uk/Chance-say-meeting/story-22846233-detail/story.html ). 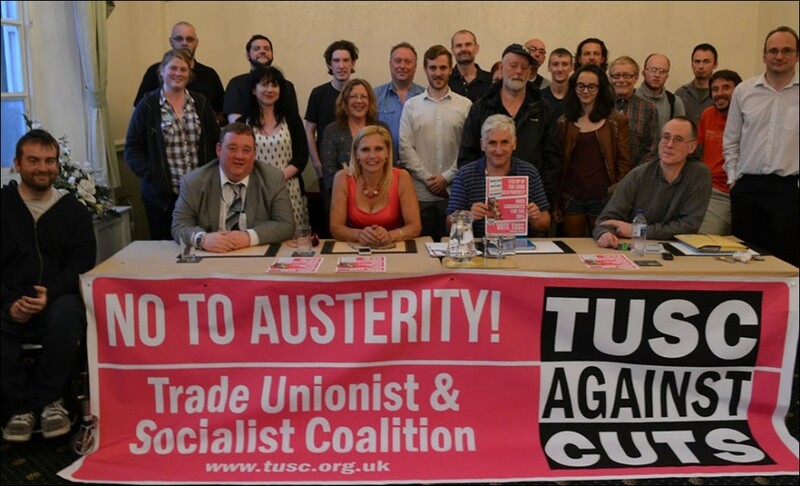 TWO LEICESTER anti-cuts councillors have agreed to join up with the Trade Unionist and Socialist Coalition (TUSC) in the ever-widening fight against the establishment parties and their austerity policies. 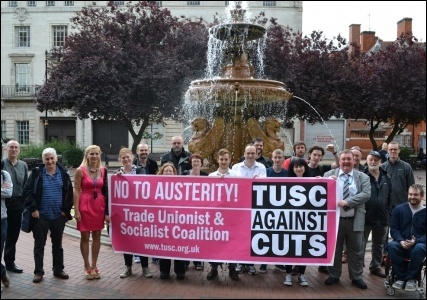 Ex-Labour councillors Barbara Potter and Wayne Naylor, who will sit on the council as the Leicester Independent Councillors Against Cuts group, will now be a constituent part of the Leicester TUSC steering committee, alongside the Socialist Party, the SWP and prominent trade unionists in the city. In a press statement announcing their decision to link up with TUSC, the councillors explained that while they were in the Labour Party they were loyal because they feared the alternative of letting the Tories in. But they were hampered in their aims of defending their local constituents and both now feel that they can do that better outside the Labour Party - and that the time had come to build something new both locally but also on a national level. "To be a part of a national political group with an anti-cuts stance is what we wanted to achieve all along", said Barbara, "and we would like to thank TUSC and all of its city members for seeing that we can build a positive platform in Leicester". "We want to build something that is credible for everyone who feels let down by both the government and the Labour council who are delivering cuts. We believe that there is a better way than this, and we will show people that it can be done", said Wayne. "People are looking for something different, they have felt let down and need a political party that supports them in the difficulties they face". Leicester TUSC is now planning a conference to discuss a 'people's budget' for Leicester on October 4th - which Barbara and Wayne will then present to the council at its budget-making meeting next year - and will be inviting community groups, trade unions and the people of Leicester to attend and contribute their views on what services the council should provide. Are there any Stoke-on-Trent city councillors, or even just one, who are prepared to join with TUSC to make a stand against cuts like TUSC councillors in Leicester and Plymouth and elsewhere are doing? Why not ask YOUR councillor is he or she is prepared to do so. If they say no, ask them why not! If they still say no then why don't you stand as a TUSC candidate to fight the cuts! Or maybe you would just like to help TUSC's fight against cuts?